Supernovae are popping up everywhere! Two stars flamed out millions of years ago and at least one is an easy catch right now in amateur telescopes. 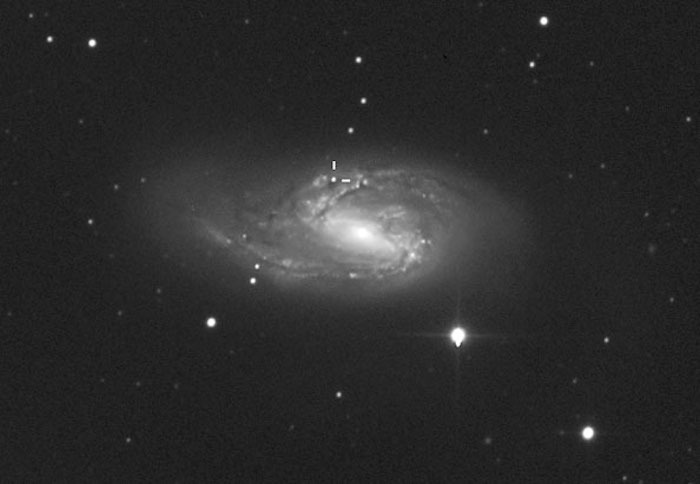 Type Ia Supernova 2016coj in NGC 4125 is now bright enough to see in amateur telescopes. You'll find it 11.7″ NE of the galaxy's nucleus. NGC 4125 lies about 72 million light-years from Earth. Recent years have seen a blizzard of new supernovae discoveries from dedicated robotic searches by both amateurs and professionals. If you have any doubt, David Bishop's excellent Bright Supernova site lists 3,471 reported in 2015. Already this year, we're up to 2,910! Sorting through them to find visual candidates takes more time that it used to, but I'm not complaining. Among the ubiquitous 18th- and 19th-magnitude candidates there are always a few bright enough to spot in an 8-inch or larger telescope. On May 28th, two new exploding stars were discovered, SN 2016coj in NGC 4125 (a 10th-magnitude elliptical galaxy in Draco) and SN 2016cok in the bright spiral M66 in Leo, by the automated Lick Observatory Supernova Search (LOSS). 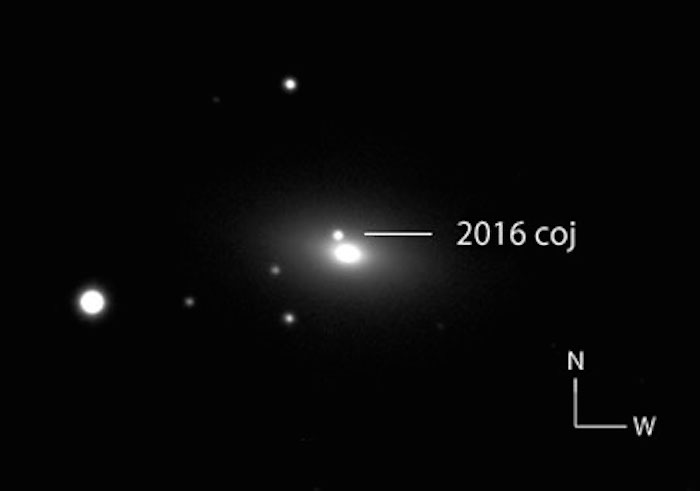 SN 2016coj's initial brightness of ~15.5 magnitude didn't immediately shout "Hey, look at me!" But in recent days, the Type Ia supernova brightened steadily to its present magnitude of 13.6, making it fair game for 10-inch and even 8-inch telescopes. Several nights back, I took a look at the host galaxy in my 15-inch (37-cm) reflector. Its location near a 6th-magnitude star a short distance north of the Big Dipper's bucket made the finding easy. When I used 142×, the supernova presented itself almost immediately as a "second nucleus" about 11.7″ northeast of the true nucleus, a tiny kernel of light buried in the galaxy's core. When the seeing steadied, the supernova stood out crisply, a sharp point compared to the slightly fuzzy galactic nucleus. Here before me eyes was the end of a life, a white dwarf blown to bits in a tremendously powerful explosion brought on by ... weight gain. After feasting on its close companion star's atmospheric gases, the Earth-sized star accumulated enough material on its surface to exceed the Chandrasekhar Limit of 1.4 solar masses and undergo rapid gravitational collapse. Dire consequences followed as a runaway fusion reaction from the crushing heat and pressure raced through the star, destroying it in one titanic blast. Since then, SN 2016coj has continued to brighten and should be an even easier target by the time you read this. Meanwhile, SN 2016cok in the familiar galaxy M66 in Leo has taken another path. Supernova 2016cok (beween the tick marks) was discovered in the bright, nearby galaxy M66 in Leo on May 28th, the same day as SN 2016coj was discovered. Unlike the latter, SN 2016cok's brightness has remained nearly constant at about magnitude +16.5. The new object is located 61″ east and 34″ south of the galaxy's nucleus in an outer spiral arm. East is up and north at right. Ordinarily, the words "supernova" and "M66" heard in the same sentence would make a deep-sky hunter's blood pressure spike. It was here in February 1989 SN 1989B peaked at 12th magnitude, within range of even a 4-inch. Given the galaxy's relative proximity to Earth of 36 million light-years, any supernovae there have the potential to become bright, but this one has so far remained faint. Discovered by Ohio State's All-Sky Survey Automated Survey for Supernovae (ASAS-SN) at magnitude +16.6, SN 2016cok hasn't gotten any brighter than +16.4 as of June 4th. It may still be on the rise, though. According to a recent notification from The Astronomer's Telegram, the supernova's spectrum indicates it was caught a few days before maximum. While a perfect target for astrophotographers, the star presents a tough visual challenge at the moment. Maybe a 24-incher can pry this one loose, but until it cracks magnitude +15.5, I'll be sitting on the sidelines watching with interest. SN 2016cok is a Type IIp supernova involving the collapse and explosion of an evolved supergiant star. But instead of fading at the regular rate, the IIp variety slows or “plateaus” (hence the p) for many days before resuming its normal decline in brightness. Has the supernova already plateaued or does a "brighter future" lie ahead? 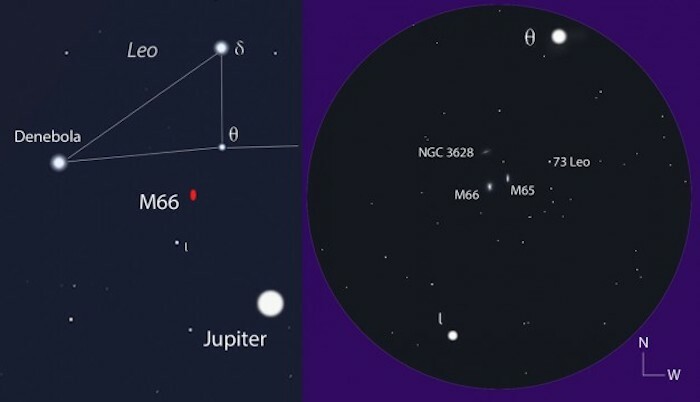 This dual map will help you find the 9th-magnitude spiral galaxy M66 and SN 2016cok located midway between the naked-eye stars Theta (θ) and Iota (ι) Leonis. The left half shows a wide view, the right half is zoomed in. Stars at right shown to magnitude +7.5. You can keep track of the progress of both supernovae at the Bright Supernova site. Click and search for "M66" or "NGC 4125" or go out the next clear night and have a look for yourself. When it comes to stellar explosions, M66 is a real champ with five recorded supernovae to its name since 1973. 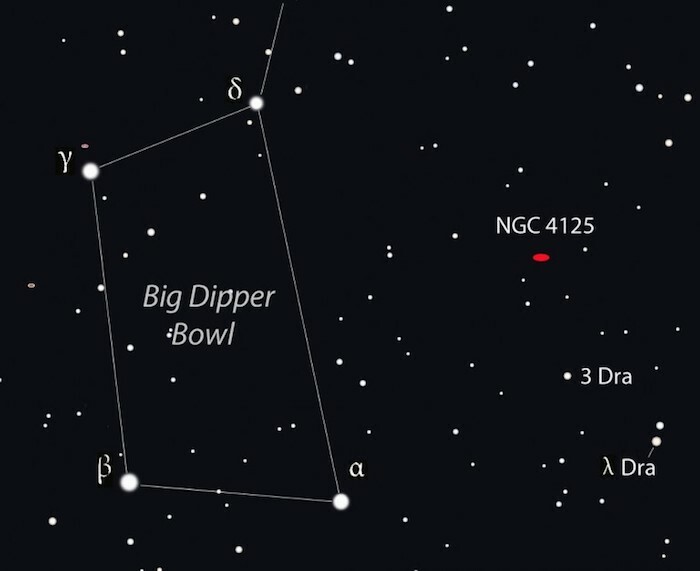 Use the bowl of the Big Dipper to navigate to NGC 4125 and its bright supernova. Stars shown to magnitude +7.5. I wish you much success in your supernovae hunt. As you slowly twist the focusing knob to bring SN 2016coj into sharp focus, consider that this pinprick of light shines some five billion times brighter than the Sun while material within the expanding debris cloud rushes outward at 9,500 miles per second (15,300 km/s). How fortunate that you and I just happened to be around to see it 72 million years later.